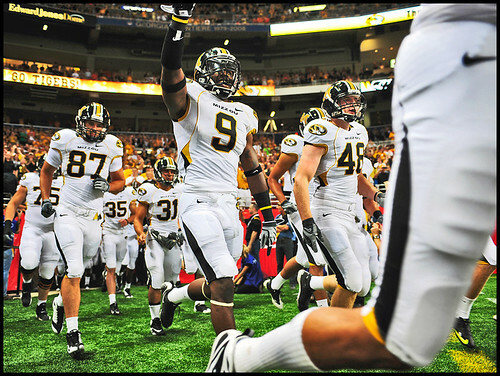 The Missouri Tigers take the field at the Edward Jones Dome. For many people, football season means ordering pizza and wings, kicking back with buddies and beers and watching the TV in the living room. For many other people, football season means suiting up in team colors, tailgating in parking lots and screaming alongside thousands of others in the stands. 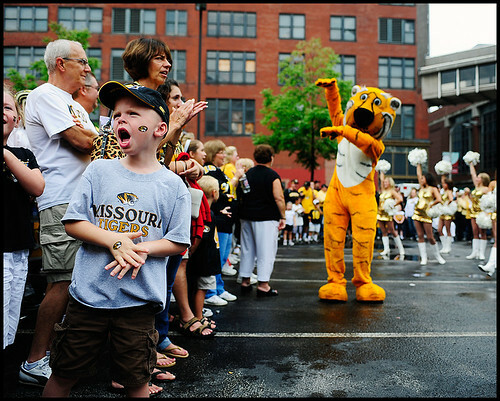 Six-year-old Liam Hampton of Springfield shouts the "M-I-Z" cheer during a rally in the alumni association area outside the Edward Jones Dome before the Missouri-Illinois game. For Missourian photographers, football season means you’ve got one Missouri home game to shoot for the paper. So you’d better make the most of it. At least, that’s how I see it. This season, I have two football games lined up for me. The first — yesterday’s Arch Rivalry game against Illinois in St. Louis’ Edward Jones Dome — was a special opportunity that I seized. The second is the Oct. 8 game against Nebraska. Me on the sidelines. Photo by Jeff. Thing is, I’ll be the first to admit I’m not very good at shooting football. ONE: I was slow in starting to shoot sports. As a freshman photographer at The Maneater student newspaper three years ago, I refused to pick up any games until one December night, my editor called and told me I had to shoot a women’s basketball game. No one else could. Trembling, I walked into the basketball arena fifteen minutes late (I had to walk there and couldn’t find the media entrance), sat down next to the other photographers, shot the hell out of the game with a borrowed lens — and promptly fell in love with shooting basketball. TWO: I’ve only ever shot one football game before — the home game against Nebraska in 2007. That shoot did not go very well. I’d rather not think about it. THREE: Equipment. Oh my goodness. Equipment. My own camera bag includes a Canon 30D and 70-200/2.8 lens. I’d never shot Nikon or used any lens longer than 300mm before until yesterday’s game — where I ended up using a D3 and D2H with a 500/4, 80-200/2.8 and 28-70/2.8. To explain how and why I ended up using gear I’d never used before and with which I was uncomfortable (going from 300mm to 500 is a big jump) would take far too long. But suffice it to say that a) circumstances dictated it and b) I figured I might as well go all out since this was one of only two games I’d get to shoot. (A) was the biggie. Here's an oopsie. Missouri senior wide receiver Danario Alexander fails to catch a pass from sophomore quarterback Blaine Gabbert during the first half of the MU-Illinois game. Missouri sophomore defensive back Kenji Jackson attempts to tackle Illinois sophomore running back Mikel LeShoure during the game's first half. 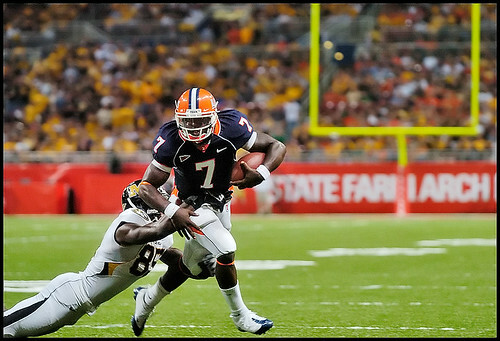 Missouri freshman defensive end Aldon Smith sacks Illinois senior quarterback Juice Williams at the start of the fourth quarter. As you can see, I did get some shots. I wouldn’t say they’re anything spectacular or portfolio-worthy. A lot of the photographers who shot for me while I was the 2007-2008 Maneater photo editor did/could have done a way better job when they were still in high school. But hey. It’s a learning experience, and Jeff — who was one of those sports photographers — is going to watch some games on TV with me to point some things out, as well as accompany me to shoot local high school games. So I’m going to work on my technique: where to be on the sidelines and endzones, when to shoot vertically, how to follow the action more closely, etc. With all the effort I’ll be putting into this, I hope to get much better shots when I shoot the Nebraska game in one month. 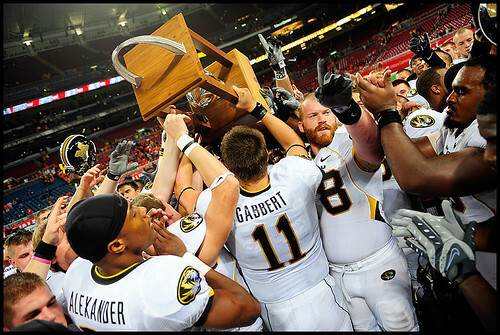 Missouri senior wide receiver Danario Alexander, sophomore quarterback Blaine Gabbert and graduate student offensive lineman Kurtis Gregory celebrate Missouri's win on the field with the Arch Rivarly trophy. Another thing about shooting football: I encountered a lot of sexist remarks or other comments that a male photographer wouldn’t have received. The man, I’m sure, had no bad intentions. But later during the game, some Missouri fans shouted really nasty, crude things at me (pertaining to how long and phallic the 500mm lens is), which was just way over the top. I chose to ignore those fans, who were probably drunk, but that nevertheless rubbed me the wrong way. I think I almost prefer accusations of being the liberal media over crude taunts for being one of three women in the entire press pool and carrying a long lens. 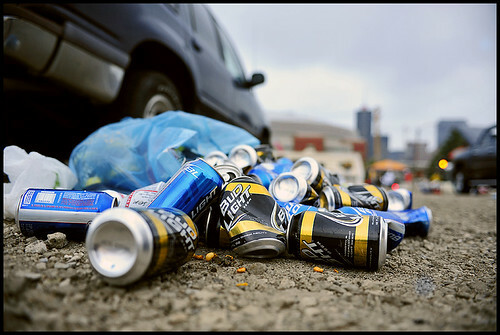 Cans of Bud Light spill out of a recycling bag in a parking lot near Edward Jones Dome after the MU-Illinois game. The cans with team colors have attracted controversy after university officials claimed that the cans encourage drinking among sports fans. Regardless of how unfamiliar I was with my equipment, how sexism in sports culture is unacceptable and how badly I shot the game, the important thing is that I’m going to work toward being a better football photographer. In one month, hopefully I’ll have fantastic shots from the Nebraska game to show for all my efforts. In the meantime, please view more of my photos from the Illinois game. Thanks Stephen! Next time I shoot, the lens will be smaller. But only slightly…! Missouri fans “nasty, crude, and drunk”? Shock this Husker fan, already. Anyway, Ms. Dunn, if you really want to further your career, you may want to consider pulling this post from the http://www.whatever. Nobody likes a whiner. Thanks for your concern, Lou.